O’Haire Trailers presents the new generation of Tipper Trailers from Ifor Williams. The tipper trailer range from has updated some model names. The Ifor Williams TT85, TT105 and TT126 have become the TT2515, TT3017 and TT3621 but owners will be happy to know that the trailers retain their size and volume capacity. 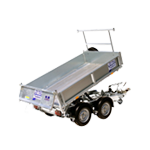 The Ifor Williams TT2515 (8’ x 5’), tipper trailer has a maximum gross weight of 2700kg with the added option of a manual or electric hydraulic pump with self contained 12v battery. A regular on building sites all over Ireland the tipper trailer is the builder’s perfect partner. 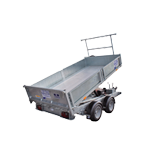 Ifor Williams tipper trailers are built to last and come with a strengthened aluminium floor as standard. The electrically operated models of the range, the TT3017 (10’ x 5’6″) and TT3621 (12’ x 6’6″) come with a self contained 12v battery. 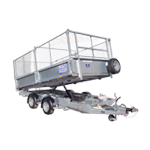 The full range of Tipper Trailers are available to view at the O’Haire Trailers showrooms in Kilmaine, Co. Mayo.